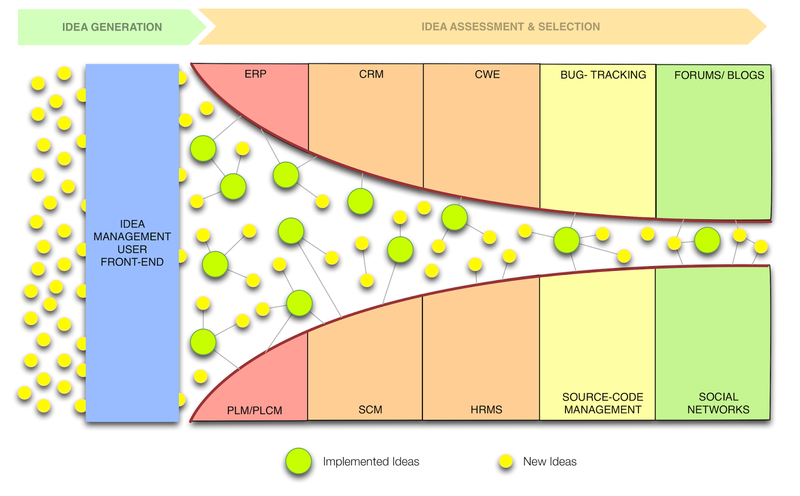 Definition of an Idea Management System. An idea management system is simply defined as a wholistic methodology for collecting, filtering, and implementing ideas. Traditionally, these systems were paper based and required great manual effort to manage. In the 1990s organizations began using spreadsheets and databases to help record and catalog ideas, however these early "digital" methods did not allow many people to interact with the data. It wasn't until recently, and really in the last 5 years, that web 2.0 technologies helped propel idea management into a new dimension. The modern systems enable users to interact with ideas through it's entire lifecycle. What's better is the fact that with modern web based systems every user can search through the database to learn which ideas have worked and which ones haven't. This makes idea management systems like Eureka unique best-practice reservoirs which are ideal and necessary in every organization. Posted on Monday, April 16, 2012 by George R.
Managing to store all that data, search it, build requirements from it and then deliver a better-tuned end product as a consequence is a thrilling development enabled by the explosion of communication over the past ten years. Much industry is still reacting to it, but the modern systems out there have great potential to help transform their working practives. Thanks for sharing your take on the history of ideas management. Yeah dear George R, I really agree to Luke W. but I am also looking to your effort daily , dear you have much information about all this so I suggest you to keep sharing.. Many heads are better than one.